One of the simplest and yet best strategies, is to get long when price is visiting a trendline in an uptrend after a downward correction or to get short when price is visiting the trendline in a downtrend after an upward correction (see the two daily charts of EUR/USD that are following. Also for better understanding of the strategy read the page ”A very simple trading strategy”). The main problem with this strategy is that price doesn’t always stop exactly on the trendline but after it has broken it. This gives the impression that the trendline will not hold and the trend will reverse. Someone who will jump into the trade exactly when price touches the trendline is in danger of get stopped out only to see that price is going in his/her favor after some time. A way to avoid this situation is to wait for confirmation before opening the position. This confirmation can be provided by a candlestick pattern. 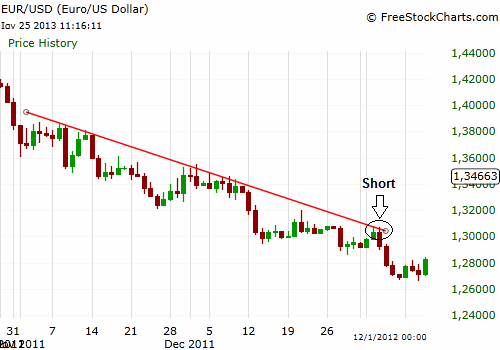 Many times there is no candlestick pattern to signify the continuation of the trend. In these cases even a green long and relatively solid candlestick in an uptrend (red in downtrend) is better than nothing or you can strictly take only the trades that are accompanied by candlestick patterns (this will lessen the number of trades taken, but simultaneously augment the percentage of successful trades). 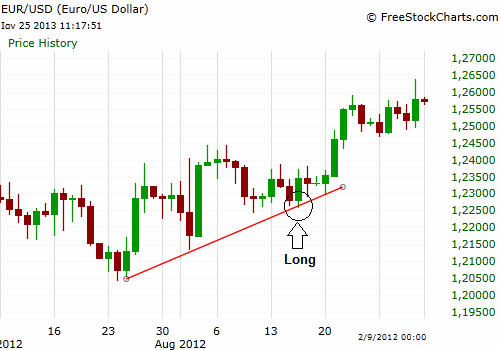 Below we can see the daily chart of USD/JPY. Notice that the uptrend is breaking with a red solid candlestick (in the circle) and the next day price is moving further down (the tail of the green candlestick). This could have triggered the stop order. 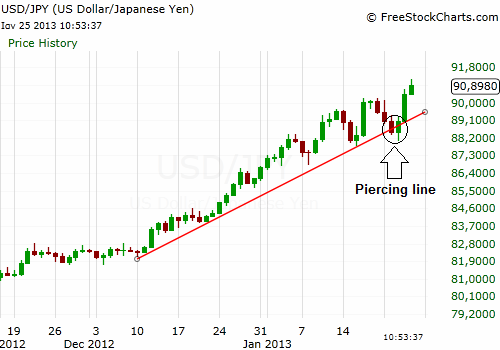 At the end of the day a piercing line candlestick pattern has been formed on the trendline. This is a high probability sign that the uptrend will continue. Of course don’t expect this to happen all the time. There will be instances that the breaking of the trendline will be the reversing of the prior trend and also even a candlestick pattern on a trendline can give a false signal, but the times that the strategy will work are much more than the times it won’t and this is what matters mostly in all strategies. The rest of the work will be done by risk management rules and stops which will make the money lost in losing trades much less than the money won in winning trades.